Property 3: Seascape One - located in the heart of Palm Beach. Great family location! Property 15: Bright and Breezy - Dog Friendly - Min. 4 night stays! 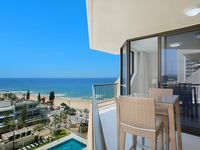 Property 16: Kirra Vista 9 - Kirra Beachfront - Min. 3 night stays! Property 32: Calypso Plaza 419 - Coolangatta Beachfront! Property 40: Calypso Plaza 335- 337- Coolangatta Beachfront! Property 45: Ocean Plaza 1577 - Coolangatta Beachfront! Property 46: Welcome to Waves 101 Absolute Beachfront Beach Apartment. This was perfect. Just a block from the beach, restaurants and all the activity. Very clean modern apartment. It was a great property! Would probably stay here again. The only downside was there was no WiFi.